The quality of the original recording used in this analysis was particularly poor. The grayscale contrast provided here is the best depiction that could be developed of Kate Ziegler's championship swim. The full stroke cycle depicted here took 1.2 seconds (i.e., a rating of 50+ strokes per minute). The time for this event was 15:53.05, the second fastest time ever recorded. On June 17, 2007 at the TYR Meet of Champions in Mission Viejo, California, Kate Ziegler lowered the world record with a remarkable swim of 15:42.54, breaking Jane Evans' 18 year-old record of 15:52.10. Kate Ziegler's relatively direct arm pull is long, starting from a full stretch at entry (Frames #1 and #6) and finishing with an effective forearm-hand push (Frames #5 and #10). There is no indication of any section of a stylized arm pull often hypothesized in the literature. There is no "S-shaped" pull, or marked "downsweep" or "upsweep". After entry, she aligns the hand and then the forearm almost vertically (Frames #3 and #7). Once in upright positions, strong upper arm abduction followed by adduction provides the power for each arm pull. The stroke finishes when adduction of the upper arm is complete and the forearm-hand surface passes vertical. It then is extracted immediately. The power of Kate Zeigler's pull is demonstrated by the large pocket of turbulent drag in front of the propelling surface (particularly in Frame #8). 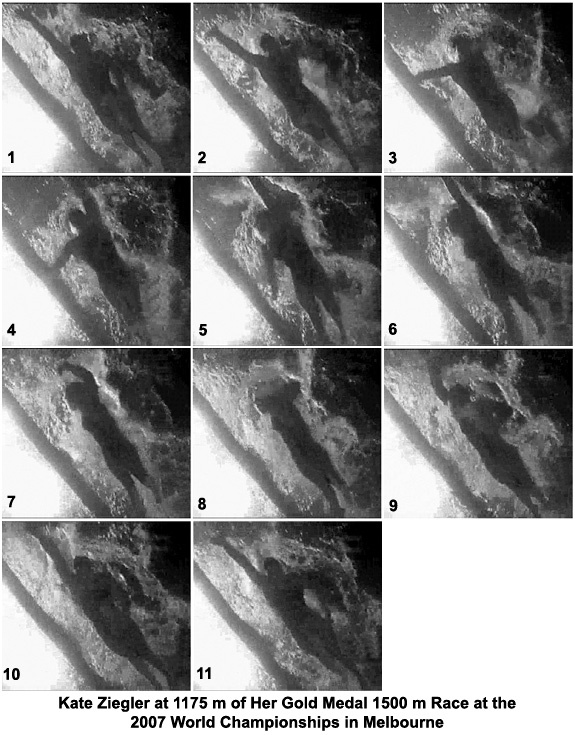 The drag pocket on the swimmer's right arm is not as obvious because of the extremely bright background that disguises the whiteness of the turbulent water. The swimmer rolls her shoulders and hips noticeably. Frames #6 and #7 show Kate Ziegler pulling on her side. At this time (June, 2007), there is considerable discussion among coaches that the shoulders should be flat when swimming crawl stroke. As has been pointed out elsewhere in the Swimming Science Journal, flat shoulders overuse the internal rotators of the shoulder pulling the head of the humerus to the glenoid labrum in the joint. In time, that causes one form of the injury known as "swimmer's shoulder". Not only do flat shoulders increase the likelihood of injury, but they also promote less power in the pull because the external rotators of the swimmer's shoulders are eliminated from the movement. This sequence demonstrates a dominant two-beat kicking action. The second place-getter in the race, Flavia Rigamonti, also used a two-beat kick for almost the whole race. Only in the last lap of the race when sprinting did a six-beat kick become dominant. Kate Ziegler is a worthy model for emulating distance swimming for persons of relatively short stature (i.e., less that six feet tall). Taller male swimmers might need to modify this demonstrated stroke by alternating two- and four-beat kicks in distance races.